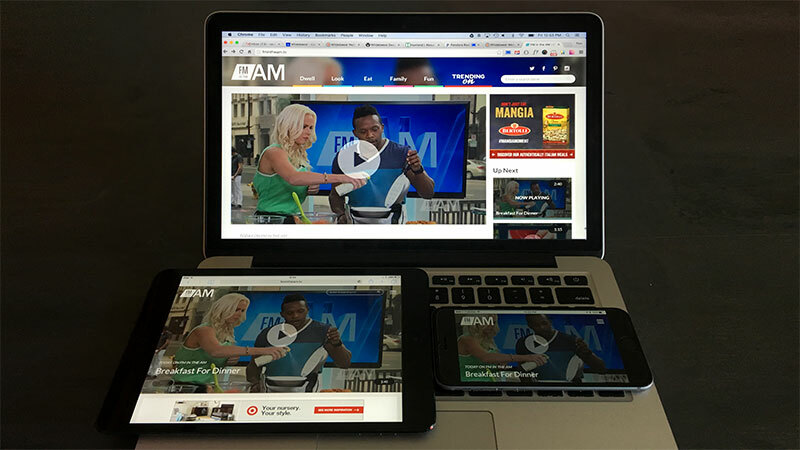 FM in the AM is the online complement to a new morning television show produced by Federated Media. The episodes are streamed and broadcast by hundreds of television affiliates across the country. The goal was to design and build a tablet-first, responsive video portal for women to view and share bite-sized, lifestyle video clips. This project was a race to the finish: the new morning show was going on air in a month and the video player was still in development. We had a lot of creative freedom with this project: the client only required that we design this product for tablet, implement their new logo and ensure that content can be added by editors with limited technical knowledge and skills. We designed a tablet-first site that also responds well to both desktop and mobile displays. We created a custom WordPress Content Management System (CMS) that allows for posts to be added quickly: a content editor simply grabs a video ID from the CDN and pastes it into a new post, along with a title, description, category, and tags. As an added feature, we built and incorporated dynamic playlists to support each video clip. These lists are sorted and controlled in conjunction with live data from the database and ensures the site serves content relevant to the viewer, but also the site’s advertisers.